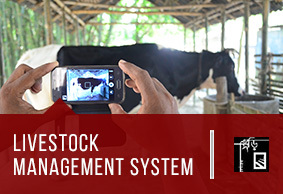 The Livestock Management System is a mobile software based product that integrates ICT mechanisms to improve monitoring and service delivery of livestock health and production management to marginalized farmers. The Seed Variety Recommendation application helps to provide helpful suggestions about seeds variety and use of fertilizers to farmers and SAAO based on the nature and cultivated crops on the land. Directly provides advice on the appropriate of fertilizer and seed through mobile app in response to any such queries. 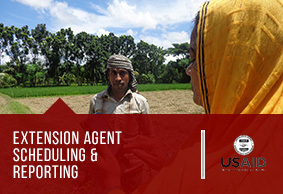 The Crop Diagnostics solution as a part of ASEA program helps to provide information about the curative measures of pest and disease related problems to Sub- Assistant Agriculture Officer (SAAO) who disseminate the solution to the farmers. The Field Challenge Capturing App enables the collection, preservation and visualization of field data and provide assistance to the extension agents (SAAO) to log their day to day solutions provided to the farmers for strategic level decision making. The crop statistics is a mobile application under the ASEA program domain for extension agents (e.g. SAAO and UAO) that enable them to digitally capture crop cultivation statistics to inform farmers about the cultivation prospects and relevant information pertaining to it. Feature that facilitates the extension agents and upzailla Agriculture Officer (UAO) to create information repository on crop production. SAAO reporting/scheduling is a mobile based tool for agriculture field extension agents to capture information of his work area. The objective of this task is to retain the knowledge of the catchment area and pass on the information to a new SAAO if there is change/transfer. SAAO makes 15 days schedule with their mobile and sends it to UAEO (Upazilla Agriculture Extension Officer). The mobile app reminds the SAAO to visit particular farmers on a specified date. Feature that allows easy sharing of catchment area information with new SAAOs. 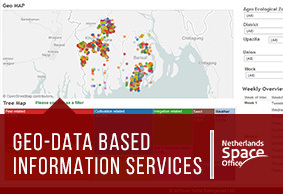 provides spatial data (e.g. NDVI maps of specific fields or areas), making it possible to locate specific areas that require more attention (e.g. caused by soil moisture stress, soil variations, inundations, ponding, etc.). 10% increase of farm income due to increased productivity of farming at 330,000 farming households. Improved management of agricultural land and more efficient use of seeds, water, fertilizers, & pesticides. Increased supply of rice, vegetables, and cereals at a reduced price. Improved export potential for agricultural produce from Bangladesh. GEOPOTATO provides farmers with weather related information, advice on the usage of seeds, land preparation, sowing, transplanting, irrigation, fertilizers and agrochemicals, and A solution that provides farmers with weather related information, advice on the usage of seeds, land preparation, sowing, transplanting, irrigation, fertilizers and agrochemicals, and advice on preventive and remedial measures for controlling pest and diseases via mobile phones, call centre, a website, app-based services as well as personal advice via extension officers and Lal Teer’s field staff. Provide farmers with weather related information, advice on the usage of seeds, land preparation, sowing, transplanting, irrigation, fertilizers and agrochemicals, and advice on preventive and remedial measures for controlling pest and diseases via mobile phones, call centre, a website, app-based services as well as personal advice via extension officers and Lal Teer’s field staff. 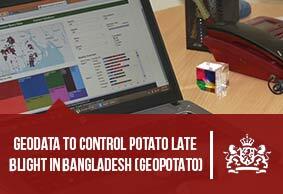 Through our ongoing pilot intervention in Munshigonj district of Bangladesh, we have raised awareness of the benefits of the GeoPotato program among 1,000 farmers to-date. Among these, 130 farmers have been positively impacted. The next phase of our pilot programme will be implemented in Rangpur district.